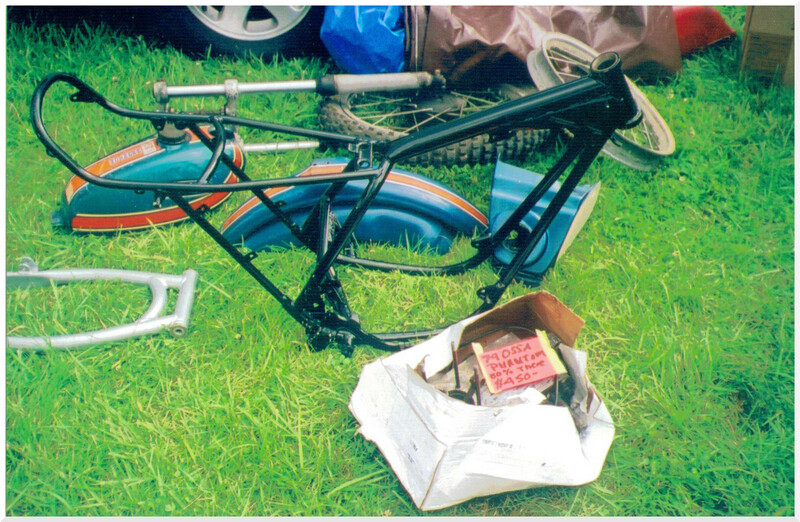 This was a mid-Ohio find, lying on the ground near the “OSSA Central” camp. Check out the first photo! Turned out it belonged to C.J. Benenati (well-known OSSA aficionado). He sold me this pile of parts for about 400 beans. When I handed the bills to him, he literally turned 90 degrees and handed the cash to somebody he owed! That’s the way it goes with old guys and vintage machines! 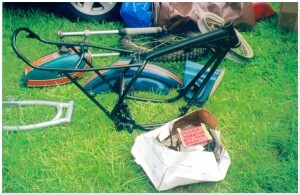 This was my first “modern” OSSA – 1974 to 1977 – much lighter frame and wheels. They dropped about 30 lbs. from the Stiletto era. The blue paint with orange stripes was a very attractive scheme!